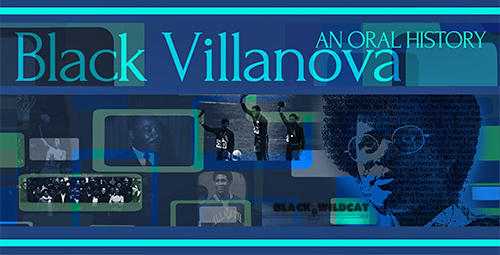 Dr. Mogan will discuss the research efforts that led to the creation of Black Villanova: An Oral History, one of Falvey Memorial Library’s online exhibits, which examines the history of the African American student experience at Villanova University throughout the years spanning from approximately 1950-1985. AB: How did you get interested in the Black Villanova Oral History Project? TM: I have always had a keen interest in the history of the civil rights movement, and this led me to pursue graduate work in history. I was conducting research for a seminar paper on the integration of African American athletes at Villanova, and I met with Dr. Ed Collymore, former executive director of Multicultural Affairs at Villanova and a former student-athlete. He shared with me some fascinating stories about what it was like to be an African American student-athlete at Villanova during the 1950s, and that set me on my journey to learn more. I knew that he was part of a much larger story that needed to be told. 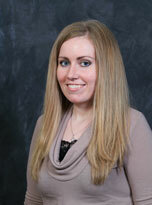 AB: Who decided to involve the Falvey Digital Library? TM: As part of my training to be a historian, I knew that it was good practice to make your research accessible to the public. So, as I began to conduct the interviews, I knew immediately that I wanted to share these interviews with the Villanova community. I approached Joe Lucia, former director of Falvey Memorial Library, with the idea, and he was very eager to support me in this endeavor. 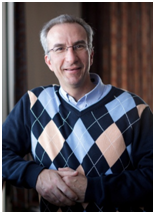 David Uspal [senior web specialist for library services and scholarly applications] has also provided invaluable assistance in developing the oral history project’s website. AB: What are your plans for the future of this project? TM: I hope to continue to add to the collection by conducting more interviews. I have added a news feature to the site so I hope to keep it updated and fresh so that people have a reason to return to the site. AB: Are there plans to publish your research (beyond the dissertation)? TM: I have spoken with several journals about publishing an article based on this research, and I will be working on submitting those by the early summer. I hope to one day publish this work as a book. AB: How did you select the subjects for the interviews? TM: As a starting point, I sent an invitation letter to several African American alumni whom I knew were leaders within the Black Student League in the late 1960s and early 1970s. Two alums in particular, Ted Freeman and Napoleon Andrews, responded quickly and enthusiastically agreed to help me find African American alumni who might be willing to share their stories. This project would not have happened without the support of these two gentlemen. I have only interviewed one woman to date so I would like to include more about the African American woman’s experience at Villanova. AB: Any additional information/comments that you would like to share? TM: This project has been one of the most rewarding experiences I’ve had in my life. In support of this project, I worked with the Alumni Association to sponsor a reunion for African American alumni during Homecoming 2012. We were able to welcome back over 40 African American alumni, some of whom had not been back to campus in over 40 years. This project has helped to begin the healing process for many black alums, and for that I am very pleased. I also hope that this project will allow Villanova to learn from our past as we continue to address issues of diversity and inclusion on our campus today. David Uspal, Falvey’s senior web specialist for library services and scholarly applications, was the library’s main point person for the project as he helped with the very difficult technical aspects of mounting the exhibit. On behalf of Uspal, his colleague Laura Bang, digital and special collections curatorial assistant and digital humanities coordinator at Falvey, says, “The Black Villanova project is a great addition to the library’s digital projects. Dr. Mogan’s interviews bring to life important perspectives on the Villanova experience for African Americans.” Work on this project will continue as it is an evolving historical record. Dr. Mogan, the project coordinator, invites additional participants in this project as he wants to include their stories in the rich heritage of African American history at Villanova University. In addition to Dr. Mogan’s Black Oral History talk on Feb. 18, Falvey will also co-sponsor the Annual Black History Month talk along with the Africana Studies Program. On Thursday, Feb. 20, at 4:00 p.m. in room 204, join us as Farah Jasmine Griffin, PhD, William B. Ransford professor of English and comparative literature and African-American studies, Columbia University presents the Annual Black History Month talk as part of Africana Studies’ Spring Lecture series. Make sure to check out these great events! Introduction written by Regina Duffy, writer on the Communication and Service Promotion team and library events and program coordinator. 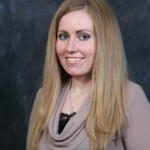 Interview by Alice Bampton, digital image specialist and senior writer on the Communication and Service Promotion team. Black Oral History Project graphics by Joanne Quinn.